Begin by talking with the Tyras Guard next to the catapult north of the Tyras Camp. 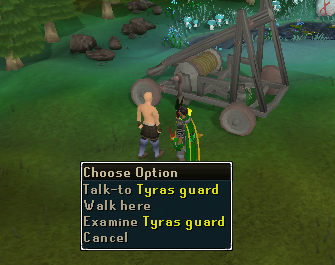 Head to the Tyras Guard next to the catapult north of the Tyras Camp and talk to him. He'll explain that he let the frame of the catapult get damp, making it rot away. This clearly wasn't good news for the General who decided to cut the Guard's pay in half, although a Catapult Engineer has been sent to try and fix it. The problem here is that the Engineer doesn't seem to have the brains to do his job, meaning your help will be required. So that you can help, he suggests that you speak to General Hining who can be found through the Dense Jungle in the camp to the south. The General will explain how vital a Defence the catapult is and gives you an Engineer's Letter to take to the Catapult Engineer. 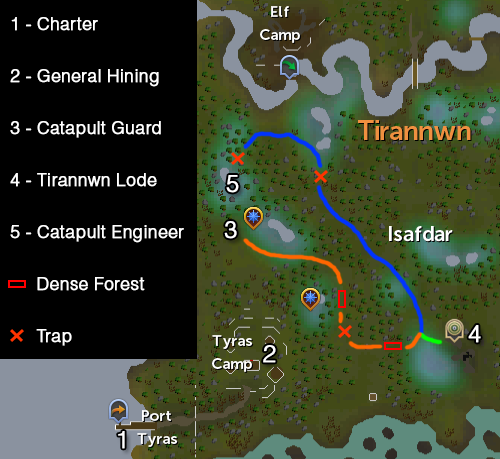 The Engineer can be found in a clearing to the north of the Catapult, although there is a longer walk that you will need to complete to get there, the route being marked in the map below. 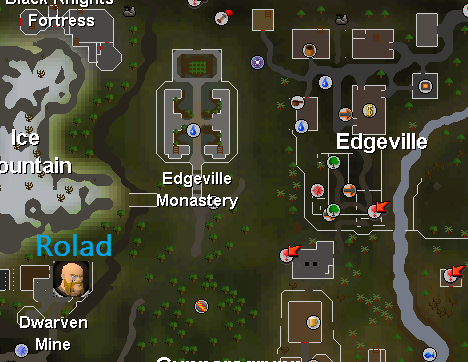 If you have the Tirannwn lodestone unlocked, teleport to it, else just follow the path. 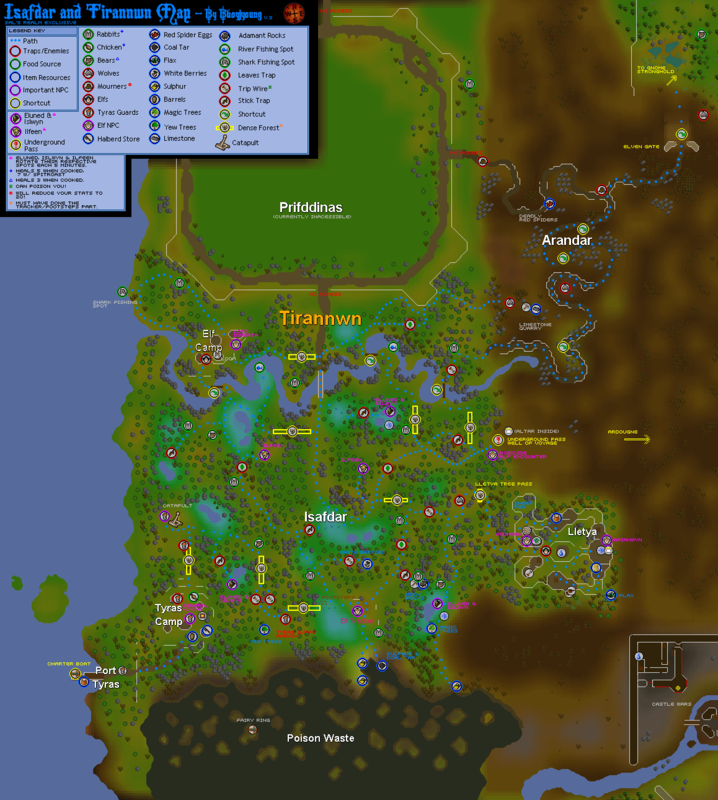 For a map of the whole of Isafdar, see the Isafdar and Tirannwn Map. Once you reach the Engineer, talk with him and he will explain how he left the instructions in his clothes which went in the wash and his Toolbox with a Saw Hammer and Knife in it was left on the ship used to get to Isafdar. This has clearly given him a problem, so he will give you the Catapult Schematics to see if you can help at all. Talk to him again and ask to see the letter which he will show you. 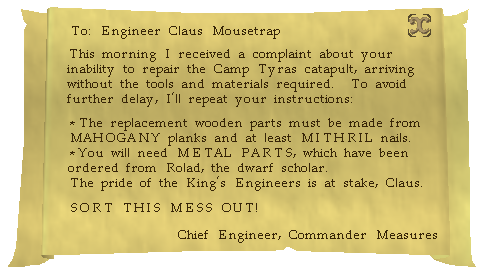 This letter combined with the conversation with the Engineer explains that to repair the Catapult you will need 10 Mahogany Planks and 90 Mithril or better Nails along with some Metal Parts from Rolad, the dwarf scholar found just south of Ice Mountain near the entrance of the Dwarven Mine. 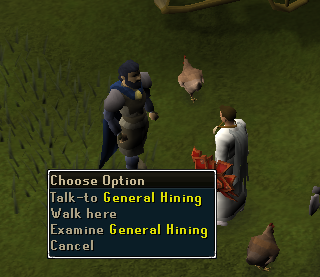 Talk to him and he will explain that the Metal Parts you are looking for have been dispatched and there is a Delivery Dwarf called Thaki in Port Sarim who was supposed to have put them on a ship heading to the Tyras dock. 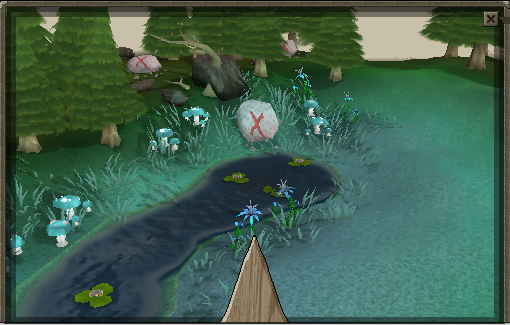 Head to Port Sarim and talk to Thaki the delivery dwarf who can be found in the Pub in the north of the town. He'll complain that you aren't a sailor because you don't have a Sailor's Hat. 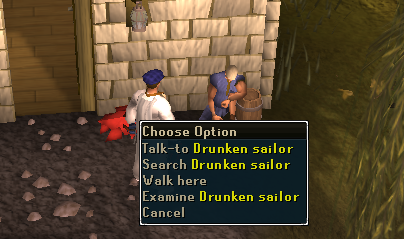 To solve this problem, just outside the Pub is a Drunken Sailor who you can search to get a Sailor's Hat. Equip the Hat, head back inside and talk to Thaki who will now have no problem with giving you the Metal Catapult Parts because you're wearing a Sailor's Hat, so you must obviously be a sailor! Now that you have the Metal Parts, there's just the Mahogany Catapult Parts to go. To make these, read the Schematics with the Hammer, Knife, Saw, 10 Mahogany Planks and 90 Mithril or better Nails in your inventory and choose to "Make the repair parts". 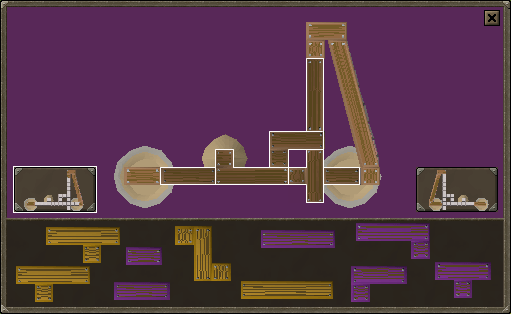 Having done this, you will have 10 Mahogany Catapult Parts in your inventory. 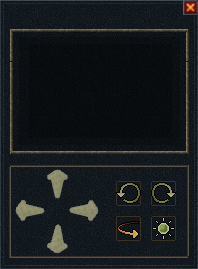 You now have all the parts needed to repair the Catapult, so talk to the Catapult Guard again. 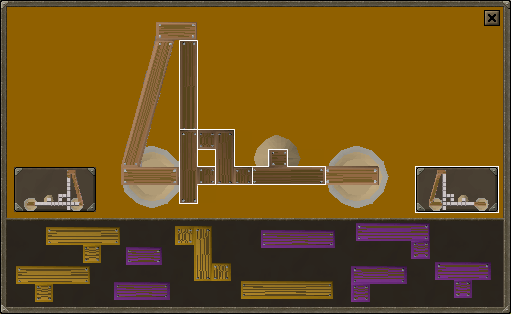 To repair the catapult you will have to complete a Tetris-like puzzle with blocks to slide into place using some basic controls that show where your inventory should be. To select a shape, select it from those below the Catapult Diagram, then move it into shape with the Directional Arrows, selecting the next shape once it is in the correct position. You are able to switch between the different sides at any time that you wish to do so and the shapes will color themselves to indicate which side they are currently being used on. Once all the shapes are in position, they will look like those in the images below and you will get a confirmation message that it is complete. Talk to the Catapult Guard again and he will explain that you need to check that the Catapult fires straight. To do this you will have to fire rocks at three boulders with large red crosses, adjusting the Direction and Counterweight (Distance) to make it reach the target. To get the nearest target, line it up with the Arrow at the bottom of the screen and lower the Counterweight all the way before pressing the red button to fire. 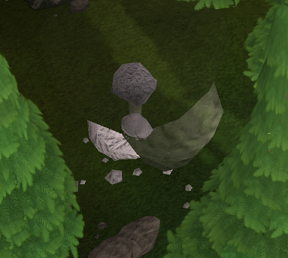 Now that one boulder is smashed, the others need to be too. To get the boulder on the right, move two positions to the right and add six to the Counterweight (so you can't go any higher) before pressing the red button. To destroy the third and final target, move the arrow six positions to the left and lower the Counterweight by one, then press the red button to watch a large plume of dust make its way into the air. 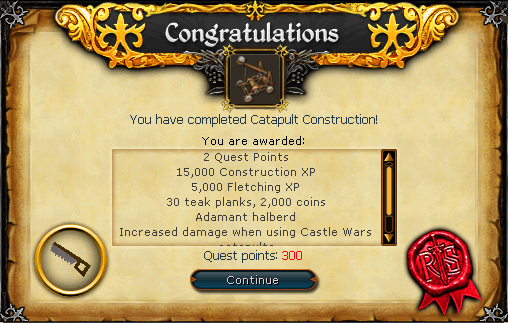 Talk to the Catapult Guard one last time to complete the Quest!